Aare you sick a tired of paying other freelance developers for fixing dead simple edits to your PHP website? Do you wish you could learn some of the basics of PHP so you can have the confidence to make simple adjustments yourself? I no longer have to pay money to have a developer fix some of the basic small issues as I did before, and I'll show you how to do the same! Learn the PHP basics from 17 info packed video tutorials. 17 Easy to Follow Videos Just Like This One. Here is just a glimpse of the topics we cover. Installing PHP on you home computer. 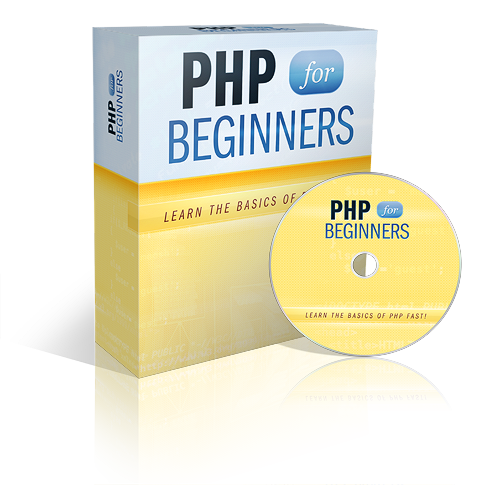 Just about anyone who uses the Internet can benefit from learning the basics of PHP. Whether your livelihood depends on making money online or you're just curious about how websites work, my beginner PHP video learning series is just what you need to get started on your way to creating, editing, and maintaining PHP-based websites on your own. If you're tired of shelling out hard-earned cash on high-priced PHP programmers making small changes to your website, then look at what I have in store for you: a 17-step program for how to learn PHP the easy way. Gone are the days of plain-Jane websites with static HTML pages. Internet success is built upon a foundation of dynamically-generated content. In fact, websites are so dynamic these days; they can practically change within seconds of viewing a Web page. When you learn PHP, you enter this dynamic world. My 17-step beginner PHP tutorial series helps you do just that! Did you know that PHP plays a major role in the Internet's core foundation, with hundreds of new sites adopting PHP each day? Well, if you didn't, I'll certainly teach you in my 'learn PHP' series of video tutorials! You also probably didn't know that PHP has been in continuous development since 1995, with PHP 6 being the latest release. The number of websites that use PHP on the Web has been estimated to range anywhere between 25 and 75 million, with individual PHP pages ranging in the billions! Yes, billions! Given its popularity, it is safe to assume that one can learn PHP without any worries, as it will be around for a long time to come. So, why is PHP so popular? Well, aside from being free, it is "open," meaning that it is not controlled by any private, for-profit companies like Microsoft or Oracle. This allows contributors from everywhere around the world to help make PHP better, and free, for all. With these facts in mind, it's pretty clear to see that PHP skills will not become obsolete anytime soon. Should you ever want to pursue Web development further for more cost savings, a hobby, or a future career, PHP is a safe and sure bet. When you learn PHP, you gain skills that will carry you for a long time to come. Even if you never write a single line of code afterwards, you'll at least have a better technical understanding of the mechanics behind the website that powers your business. What's more, you'll be able to speak intelligently with those you hire to do it for you. Sometimes the easiest parts of programming can be overwhelming for a newbie. Installing all the development tools needed to learn PHP is one of them. I break it all down for you step-by-step so you'll be up and running in no time. The word "syntax" isn't a word you use every day. Although it won't exactly get you brownie points for using it at your next business dinner, it will definitely help you in the PHP world. Syntax refers to the rules necessary to put all the pieces of PHP code together. Just as the English language has rules for putting sentences, paragraphs, and entire works together, so does PHP. I'll teach you how to make your PHP masterpiece work. Variables are where you store values for use in your PHP programs. When you learn PHP, it is essential to master this. This is exactly how everything your users type in an online form gets into your databases. No, PHP strings aren't something you tie around your finger to remember something. But I'll teach you what they are for in beginner PHP video series. People may get tired of doing repetitive procedures, but computers never do. That's what they're there for. When you learn PHP, you can put your computer to work performing processes you don't want to do yourself. My video screencast lessons pack a serious punch. There's so much more than this; in fact, you'll be able to write a PHP website all on your own. You'll wonder why you ever hired someone to do it for you in the first place. So, go ahead and try my videos out. Beginner PHP couldn't be easier, with each lesson being a small fraction of the cost of paying a PHP developer to make changes to your website for you. In fact, my beginner PHP lesson pack pays for itself after just the first few edits you make! What could be better? How about making it all risk-free! Sure, I'll make them risk free for you, offering a 30-day guarantee with every beginner PHP videos purchase. If you don't learn PHP my way, you don't have to pay! Yes, it's that simple! Extra Bonus: Sales Letter Kit & Master Resell Rights Included. P.S. 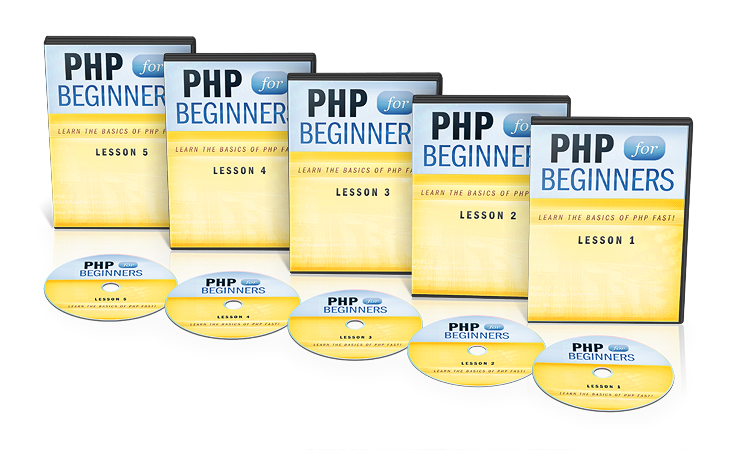 Ordering the PHP beginner videos is the smartest decision that you could ever make! DISCLAIMER: Any income examples found on this website or in the products it's marketing are not intended to represent or guarantee that everyone will achieve the same results. Each individual's success will be determined by his or her desire, dedication, background, effort and motivation to work. There is no guarantee you will duplicate the results stated here. You recognize any business endeavor has inherent risk for loss of capital. Copyright 2011, PHP For Beginners. All Rights Reserved.